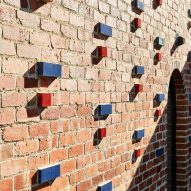 Small red- and blue-glazed bricks pattern the exterior of this house by Austin Maynard Architects, which replaces a garage in the Melbourne suburb of Richmond. 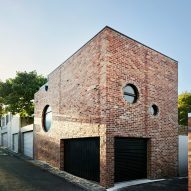 Located on a corner plot, hard up to a laneway on two sides, the red brick house acts as a bookend to a row of garages and outbuildings that extend down a hill. 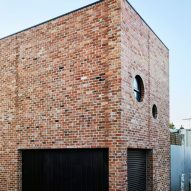 The house, called Brickface, was built for the clients' daughter on the site of their former garage and studio space. "Melbourne's property market is so inflated, that we're now seeing a generation that are not only unable to buy a home, but also struggling to find affordable places to rent close to their work, school and community," explained Austin Maynard Architects. "Melbourne does have one trick up its sleeve that many parents are increasingly exploring. 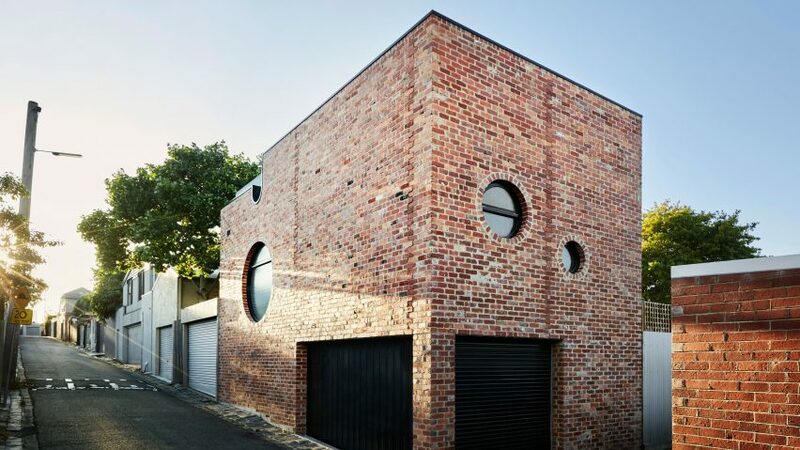 Melbourne is strewn with under-utilised laneways and many home owners are creating a second residence in their backyard with frontage to the laneway, where their adult children can live during university and early employment," the architects added. 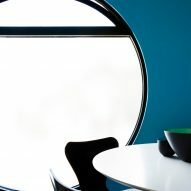 "These second residences are becoming fully independent studio homes for adult children, allowing them to save and plan, whilst continuing to contribute to the essence of Melbourne's most vibrant and cultural suburbs." 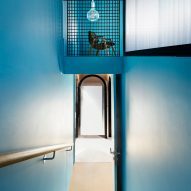 The layout comprises a garage at ground level, a studio living space with bright blue walls on the first floor, and a roof deck that functions as a garden. 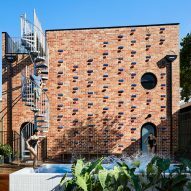 A new pool and entertaining space sits in-between the existing house and the new building, and a tall spiraling staircase made from galvanised steel winds up to the roof terrace from the water's edge. 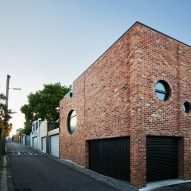 "The clients asked for a new building at the end of their rear yard," explained the Melbourne-based architects. 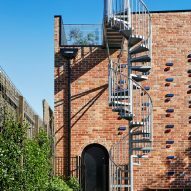 "The previous garage, with studio above, was large – it dominated the garden and compromised their outdoor space. The new building, though taller, is smaller, tighter and more efficient. It minimises its footprint to maximise the rear yard." Anticipating a future of driverless cars, the architects designed the ground floor with high ceilings and an easily replaceable door so that it can be adapted into a generous living or retail space when the garage is no longer required. 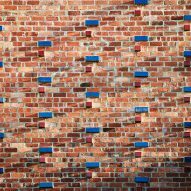 The building's recycled red brick facade, which provides a backdrop to the pool, features a slanting parapet, a pattern of contrasting red- and blue-glazed bricks, and round windows. 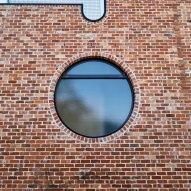 The architects explained that these unusual features help to introduce light and shadow, pattern and colour into the design while also "softening the solid block". 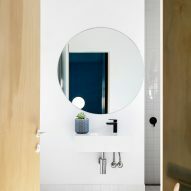 Other house extensions by the Melbourne-based practice include a timber-framed house with the living room in full view of the street and an intentionally incomplete metal-framed extension to a clapboard house near Melbourne.